Photograph, Portrait of Carey Croneis while at the University of Chicago. Courtesy of The University of Chicago Photographic Archives. Image available on the Internet and included in accordance with Title 17 U.S.C. Section 107. CRONEIS, CAREY GARDINER (1901–1972). Carey Gardiner Croneis, geologist, teacher, and university administrator, was born on March 14, 1901, in Bucyrus, Ohio, the son of Frederick William and Nell (Garner) Croneis. He received a B.S. degree from Denison University, Granville, Ohio, in 1922, an M.S. degree from the University of Kansas in 1923, and a Ph.D. from Harvard in 1928. He was an instructor in geology at the University of Kansas (1922–23), the University of Arkansas (1923–25), and Harvard, Radcliffe, and Wellesley (1925–28). He worked on geological surveys in Arkansas, Kansas, and Illinois. In 1928 Croneis went to the University of Chicago, where he was assistant professor of geology, associate professor (1931–41), and professor (1941–44). 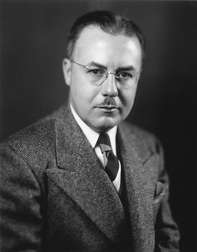 He organized the geology section of the Chicago Museum of Science and Industry and was curator of paleontology at the Walker Museum, University of Chicago (1928–44). At the Century of Progress World's Fair he was in charge of the geology section (1933) and chief of basic sciences (1934). He produced films on geology for the University of Chicago and the National Park Service. Photograph, Picture of Carey Croneis addressing a crowd while he was president of Beloit College. Courtesy of Beloit College. Image available on the Internet and included in accordance with Title 17 U.S.C. Section 107. During World War II he was a consultant for the National Defense Research Committee and in this capacity helped plan coastal defenses for the Brownsville, Texas, area. He also helped select the proving grounds for the United States Chemical Warfare Service in the Republic of Panama. In 1944 he was named president of Beloit College in Wisconsin. He designed the geology department at Rice University in 1953, and in January 1954 he became the provost there and the first Harry C. Wiess professor of geology. Croneis was named acting president of Rice in 1960; in 1961 he became the university's first chancellor. He maintained a teaching load along with administrative responsibilities and was also involved in Houston civic affairs. He was chairman of the Houston City Charter Committee and is credited with influence in the decision to establish the Manned Spacecraft Center (now the Lyndon B. Johnson Space Center) near Houston. Croneis was the founding president of the Houston Council on World Affairs, a charter member of the Texas Academy of Science, and a member of the Centennial Committee of the American Museum of Natural History in New York City. He was editor of Harper and Row's Geoscience Series (from 1941), associate editor of the Journal of Geology (1930–45), and author of Geology of the Arkansas Paleozoic Area (1930) and numerous scientific articles. He coauthored Down to Earth with W. C. Krumbein (1936). 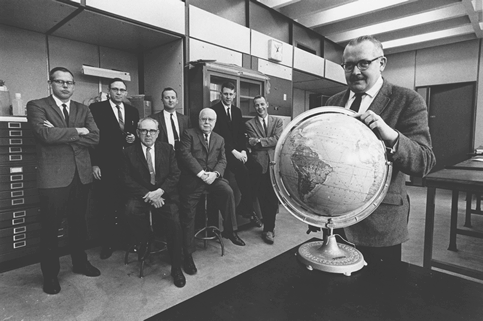 Photograph, Picture of Carey Croneis and his associates who designed and founded the department of geology at Rice University. Courtesy of The Industry-Rice Earth Science Symposia. Image available on the Internet and included in accordance with Title 17 U.S.C. Section 107. 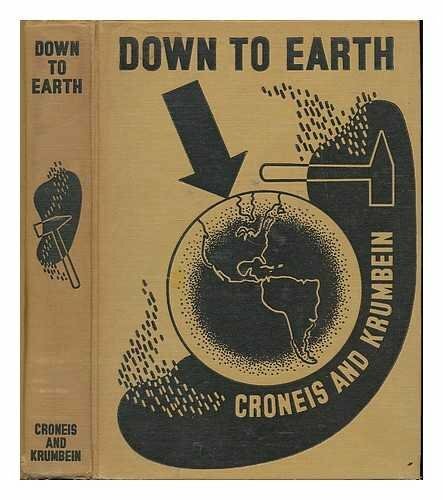 Front cover of Croneis' co-authored book, Down to Earth. Image available on the Internet and included in accordance with Title 17 U.S.C. Section 107. Croneis, a Phi Beta Kappa, was awarded nine honorary doctorates during his career; in 1967 he received the highest honor in professional geology, the Sidney Powers Memorial Medal, from the American Association of Petroleum Geologists, and the same year he was presented a gold medal by the Association of Rice Alumni for distinguished service to the university. He was elected a fellow of the World Academy of Art and Science. In 1970 the American Federation of Mineralogical Societies established in his honor five two-year scholarships for graduate study in earth sciences. Croneis was president of the Philosophical Society of Texas in 1971. He retired as chancellor emeritus of Rice University on August 31, 1971. He was married to Grace Williams on September 15, 1923, and they had two daughters. Croneis died in Houston on January 22, 1972, and was cremated. Memorial services were held at Rice Memorial Chapel. Houston Chronicle, January 23, 1972. Houston Post, January 23, 1972. Proceedings of the Philosophical Society of Texas, 1972. Who's Who in the South and Southwest, Vol. 11. Handbook of Texas Online, "CRONEIS, CAREY GARDINER," accessed April 19, 2019, http://www.tshaonline.org/handbook/online/articles/fcr27.